November is a tough month. You are settling into uni life and living more independently but it’s normal to feel homesick and lots of people get stressed over their first assessment deadlines. That’s why we are taking this month to focus on your wellbeing. We are putting on activities and events all through the month to help ease your anxiety, meet new people and live a bit healthier. It's time to recover from Atmosfear and look after yourself. 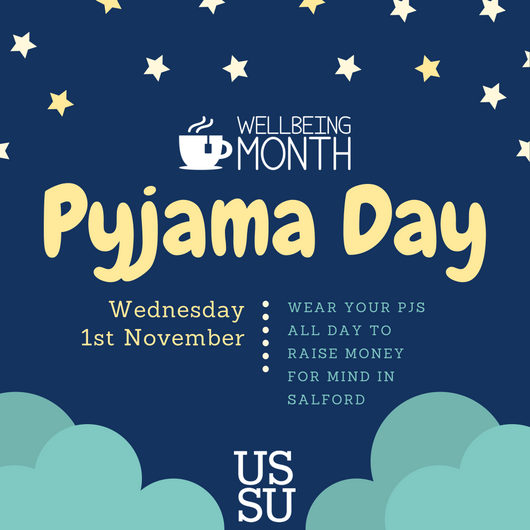 Wear your pyjamas or just whatever makes you feel comfy and drop a small donation at University House. All proceeds go to Mind in Salford.